Look at the soy sauce. Just a bulging mercury-like puddle on the table. Haha, gross. That title, like this cracker, is a mouthful. It's no secret that the journalists here at Pound Exclaim love Triscuit crackers. Whenever the crackers are on sale at our local farmer's market (for national snack brands) our breakroom is always stocked. I swear the price for 7-9oz of processed wheat fluctuates more than crude oil. I'm not sure how new of a flavor Wasabi & Soy Sauce might be, but I've never yet had the pleasure to sample this particular variety. So this is really exciting. The box suggests trying these alone or with edamame dip. Like most Triscuit consumers, I'll be eating these alone. I sit in the corner of a dark room fantasizing about what it would be like to throw the best party ever and all of my friends are there complementing me on my great selection of cheeses and crackers and dips. Even some local celebrities--like the traffic girl from the news channel--heard about my awesome little soiree and stopped by to see what it would be like to attend such a great party. Each different flavor of Triscuit is paired perfectly with a different wine that complements both cracker and cheese/dip. "Such robust yet delicate flavors. These pairings are terrific," the traffic girl says to me, "are you a professional sommelier?" I blush and admit that I am not, but that I do like to travel and also dabble in a little of this and a little of that. She smiles and laughs. It might be the wine, but I think I'm in love. 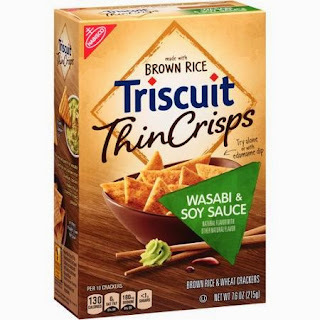 Finished with my third box of Triscuit crackers I exit the trance and remember that I'm writing a professional cracker review on a popular lifestyle blog. Neither will I dip them in edamame dip (recipe on back (it seems complex = effort/reward imbalance)). These crackers are made with brown rice and also wheat. It's like they're trying to hop on the gluten-free bandwagon, but don't want to abandon their roots. Or that full-on brown rice crackers could chip a tooth. This box is 7.6oz, whereas a box of standard issue plain flavor Triscuit crackers is 9oz. These are also shaped like triangles, as opposed to square. It makes them more fun to eat. "We're not your mom and dad's boring old cracker!" Though, most of the triangles are missing their tops from in-box breakage. Unless this is an intentional Illuminati / Eye of Providence kind of deal. Let's see: NABISCO has 7 letters. There are "about 7" servings per box. Seventh son of a seventh son. 10 crackers per serving, 130 calories per serving. 13 calories per cracker. The thirteen colonies. 3 pointed triangle. 33 1/3 is the highest degree of freemason Naked Gun movies. I'm onto something! Appearance: Besides what's been mentioned, these are a light brown cracker. The salt and flavor powder sparkle like crystals uniformly across the surface. Mouthfeel: These are very crunchy crackers. There is an air pocket between the two layers of woven rice/wheat that give them a lightness. Chewing the cracker reduces it to kind of a grainy, sandy mush. Fingerfeel: They leave a light residue of oil and flavor powder. Not terrible after a couple, but if you pound the whole box you'll probably have to wipe your hand on your shirt sleeve or let the dog lick your fingers. Aroma: The scent is mostly soy. I can't detect too much wasabi on the nose. It's noticeably malty. Flavor: Very salty. Some probably comes from plain old salt and some probably comes from the salt additives and some probably comes from the dehydrated soy sauce. But it does taste like soy sauce and wasabi. It's not much like real wasabi (I've never had real real wasabi). The whole flavor profile is like if you took brown rice onigiri dipped in wasabi and soy sauce and then reduced the essence of that flavor into a cracker. Pizza Pringles don't taste like pizza, but you get it. Wasabi spice level: not spicy. You won't wheeze or flush or anything on these crackers. It's a very mainstream approach to the flavor. Over all they did a pretty good job on these. Although, I can't really imagine a scenario where they'd be appropriate. Realistically I see these crackers in the pantry of a day-drinking-stay-at-home-cool-mom. She smears some canned tuna on them and pretends she's back in Cali on her honeymoon eating fresh sushi with her bae. If you like those wasabi pea snacks, you might dig these. But I probably won't buy again.